I will never cook a steak another way moving forward, this gives fantastic results. Sounds similar to sous vide. Only difference is cooking in water bath at specific doneness temp and searing after. Looks pretty darn good! How are you searing it on a cast iron skillet or on a grill? 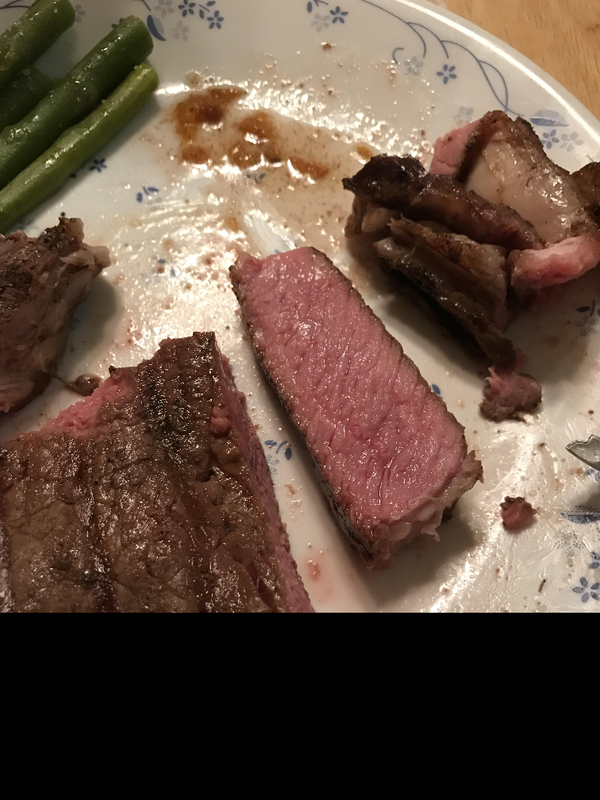 I'm still working on the perfecting a good hot sear without cooking the steak any further. Inside on the stove with cast iron skillet. If the weather is nice I'll start trying it on the grill. Dear lord, that looks perfect! Looks great. I'm going to being doing another steak in a few days. I first tried it after reading about the method on the Thermoworks site. I use the Dot to monitor the temperature in the oven. I will begin searing at a lower temperature so it looks likes yours. Just perfect. I cook on the grill at the lowest heat setting, flipping every 5 minutes or so while monitoring the temperature. When the steaks hit 125ish, I take them off and put them on a plate and cover them with foil while the grill warms up to full heat. Then I sear it for about 1 min per side. I like ‘em rare so probably would do them to about 100ish and sear. I'm looking forward to trying this on my next steak. Yours look delicious @radagast and I see the asparagus on the side as well. Add a nice starch and that's my kind of meal for sure! Tomorrow will be a brew day, watch the snow fall, and have steak night. Start off with a simple salad. 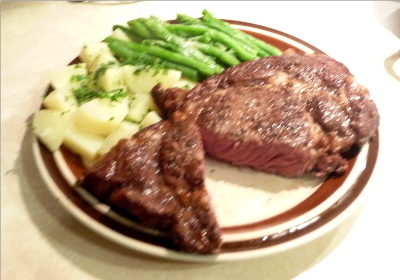 Follow with buttered potatoes topped with chopped parsley and green beans to share the plate with the steak. I love this method. I typically use my smoker for the low temp part, then sear. So yummy. I did get my brew day in and a reverse seared steak. Camera focus is a little off. I need a larger plate for the New York strip that's waiting in the freezer. Looks like a delicious reward for a productive day! No brew, but there was a half finished spicy Bloody Mary on the table. Nah Sneezles, you got it confused! Beer goes with the grilling of the steak, red wine (personally prefer Pinot Noir or Cabernet depending on my mood) goes with the steak. Although I bet a Bloody Mary would be good too. Never pegged you as one of those small plate types. Some one mentioned sous vide for warming the steak before pan searing. I was contemplating giving it a try. This morning Thermoworks emailed a blog post on doing this. I'm going to try it. Don't have a sous vide apparatus so will have to just go with watching the water temperature in a kettle.